Home brewing isn’t a necessity but it is therapeutic. I haven’t had the chance to put my skills on display in quite some time. No better way to get back on the band wagon than to brew up a batch of Northeast India Pale Ale (NEIPA). Rabbit NEIPA gets it name from the most recent Avengers movie: Infinity War. In it, Thor, refers to Rocket as Rabbit. I immediately found that funny. It is funny since Rocket is a raccoon and, in multiple movies, they make fun of the type of animal is might be. I find this funny and knew I had to name a beer after the banter. The itch to brew was upon me a couple of weeks prior to actual brew day. 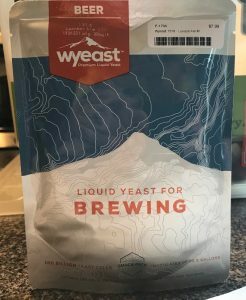 I made a trip to the local home brew store and I had one major goal: get some liquid yeast. Specifically I was looking for Wyeast 1318 – London Ale III. I have seen many recipes that use this yeast in NEIPAs but I always seem to be crunched for time with brew days being more of a spontaneous event rather than planned. Home brewing a NEIPA has certain prerequisites for me: oats/wheat (or both) and hops that will give a solid tropical aroma and flavor. The oats and wheat are always the easy part. I keep playing with the hops, leaving out Citra many times, to see if there are other variations that yield said tropical profile. I have been about 50/50 so far. I decided to go for a typical style profile using Citra. Simcoe was laying around; easy decision. Throw in a dash of Azacca and it sounds like a winner. The kegging of this beer let the aromas free, creating anticipation for the first real taste. Enjoy! 2018-10-01 evening: @67.1*F, added first round of dry hops. 2018-10-02 evening: @67.3*F, added second round of dry hops. Useless Fact: Statistically, you are more likely to die on the way to buy a lottery ticket than you are to win the lottery itself. You are currently browsing the Sips blog archives for September, 2018.